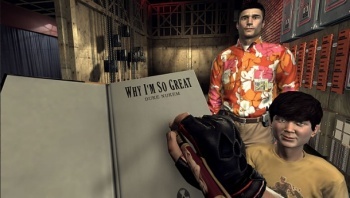 Gearbox boss Randy Pitchford estimates that it took more than one million man hours to finally finish Duke Nukem Forever. Duke Nukem Forever is the most famously-delayed videogame of all time, but how much time has actually been sunk into it? We'll never know for sure; at this point, current DNF studio Gearbox isn't even entirely certain who worked on it over the years, much less for how long. But Gearbox boss Randy Pitchford recently put up an estimate on the PlayStation Blog and it's a whopper. "I have estimated that 3D Realms invested between 3,500 and 4,500 man-months of effort into the game, a lot of which has been lost to the ages," he wrote. "Meanwhile, by the time Gearbox ships the game we'll have put in another 2,500 man months of effort. I've never been involved with a project of this magnitude." That's six thousand man-months of work at the low range of his estimate, which according to Shacknews works out to an astounding one million man-hours of work. That's just sheer craziness no matter how you slice it and to be frank, unless the game is going to cure cancer or bring peace in our time, I don't think it's something to be terribly proud of. Which is by no means meant to point a finger at Pitchford and the Gearbox gang. After all, its involvement after more than a decade of screwing around by 3D Realms is what brought the game back from the precipice of oblivion. But what could possibly justify the need for that kind of effort is beyond me, especially since, as Pitchford noted, Borderlands, which "involved the invention of an entirely new universe and new technologies to support crazy features like millions of guns," took 3500 to 4000 man-months to complete. Maybe it'll be awesome, but will it be a million man-hours of awesome? We'll find out in June!